‘Graciela Iturbide’s Mexico” is accurate enough as a title. The show runs through May 12 at the Museum of Fine Arts. Iturbide did take all but two of its nearly 140 photographs in Mexico. But the title is also limiting. Sense of place matters, certainly. The strong light, sharp edges, and marked contrasts of her native land very much inform Iturbide’s images. But those elements hardly limit her work. What makes the show extraordinary owes so much more to her artistry than to where she has practiced it. Iturbide’s “Mexico” belongs in any atlas of the photographic imagination the way that Josef Sudek’s “Prague” or Atget’s “Paris” does. An early photograph in the show, of a Mexico City display window, recalls Atget. Two others, each showing a covered automobile, more consciously bow to Robert Frank. Their presence simply underscores how little Iturbide owes to other artists, with the exception of the greatest of all Mexican photographers, Manuel Álvarez Bravo, who was her teacher. Born in 1942, Iturbide didn’t begin studying with him until her late 20s. This is an important point. She set out with more experience of life than most fledging artists have. The relationship between experience and emotion was more balanced at the outset, which may be one reason why her early photographs seem in no way immature. The wondrous contrapposto of a girl in front of a stone facade is itself an instance of balance. Or there’s the way Iturbide presents a small pair of angel wings (!) attached to the passenger door (!!) of a pickup truck (!!!) with such matter-of-factness that she manages to honor so surreal a sight without hitting the viewer over the head with the juxtaposition. The inspiration for the show is the museum’s acquisition of 37 Iturbide photographs. Curator Kristen Gresh has divided the show into several thematic sections. This makes sense twice over. It helps make such an extensive show less overwhelming. More important, it helps demonstrate a key point about Iturbide. The sections are highly diverse — subjects include fiestas, birds, death, the Oaxacan city of Juchitán, a botanical garden — yet that very diversity highlights the unity of her style and sensibility. For all that the content of an Iturbide image can differ wildly from that of another — a Mexico City street scene, say, as against a view of the Sonoran Desert — both are unmistakably hers. 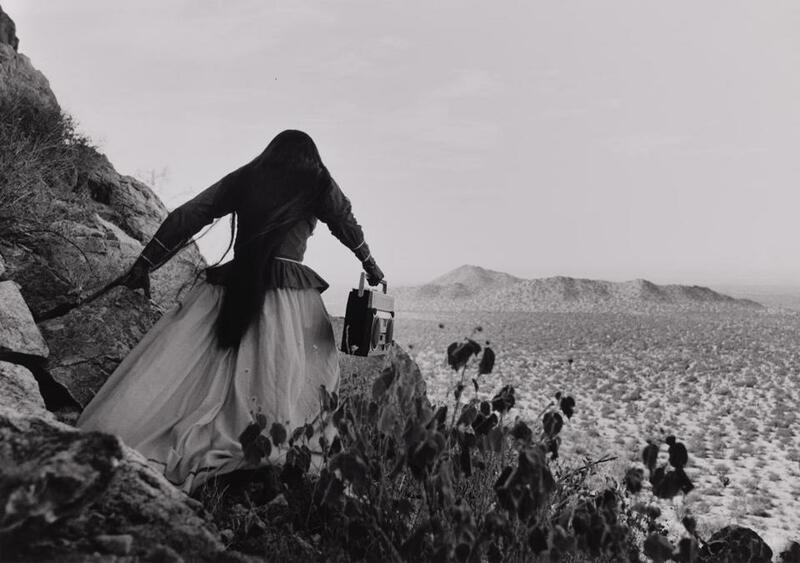 Iturbide took one of her most famous images, “Angel Woman,” in that desert. It shows a woman from behind, skirts billowing, arms outstretched. In its combination of grandeur and simplicity, it could be something out of the Old Testament. Her stooped bearing, the angle of her arms, the desert setting: She’s . . . bearing water? No, look more closely. It’s a boom box. (The year is 1979.) Look even more closely, and notice the vegetation in the foreground, the various fabrics of the woman’s garments, sand, stone: The play of juxtapositions extends far beyond the temporal or cultural to the textural. Here as so often in her work, compositional simplicity yields a density of complexities: a chaste profusion. Walker Evans, an artist of very different ilk, described his preferred mode as documentary lyricism. Iturbide, who has said “More than in time, I’m interested in the artistic form of the symbol,” operates within a style one might call documentary symbolism. The hard and fast realities of daily existence fill her work. True, they might be specifically Mexican realities: cacti, iguanas, the ritual slaughter of goats. But that exoticism, to norteamericano eyes, makes them no less real. So that what can seem symbolic has a weight denied the merely abstract or conceptual. What is lyrical in her work is also adamantine. So often severe, Iturbide’s images are never harsh. Or, rather, the world she shows can be harsh — very harsh — but not her rendering of it. She offers gravity without solemnity, bravura without showiness, calm without inanition. There will be the occasional signifier of time — that boom box, for example — but for the most part Iturbide’s images have a timeless quality. The pictures being in black and white is part of it. Black and white can seem to stand outside of time. It also offers fewer distractions. “Reality is more real in black and white,” the great Mexican poet Octavio Paz wrote of Álvarez Bravo. That’s a matter of opinion. With Iturbide, though, black and white definitely appears more real. “When I take color photos, I feel like it’s Disneyland,” she’s said. Disneyland you will not find here. At the same time, black and white, in this color-saturated age, can come across as self-conscious or self-regarding: a visual stunt. With Iturbide, it seems as natural, as inevitable, as the sun being in the sky. Or birds being in the sky. There are several photographs of flocks of birds seen from below: each an explosion of black against a gray background. Alfred Stieglitz took a famous series of cloudscapes he called “Equivalents.” The idea was that these tufts of white high above would represent various human thoughts and feelings: emptiness as an intellectual fullness. These Iturbide photographs — birdscapes? skyscapes? — are fullness as an even greater fullness. Simply as visual arrangement they’re stunning. If you prefer to think of them symbolically, as Iturbide presumably does, they’re no less stunning. Like any good symbol, they have room for multiple meanings: death, energy, freedom, the list goes on. Which is fine, since so does the looking. Try taking your eyes off of them. The show includes a 15-minute video interview with Iturbide that’s well worth watching. Also note that one of the sections consists of 15 photographs Iturbide took of Frida Kahlo’s bathroom. They’re striking and highly distinctive, even by Iturbide’s standards. They are separate, though, from the show proper, in a gallery on the third-floor of the Art of the Americas Wing. The gallery is closed until Feb. 27, when “Frida Kahlo and Arte Popular” opens at the museum. That’s an annoyance, except that it offers a pretext for another visit to “Graciela Iturbide’s Mexico,” not that any pretext is necessary.